In pulp and paper processing, microbiological organisms can cause many problems in white water and stock systems. Conditions found in white water systems are very favorable for microorganism growth, which will eventually create slime deposits on wires, equipment, and screens. If this slime is not removed, particles can dislodge and appear in the paper as spots, holes, or tears. These microbes can also have bad effects on the finished paper, such as high spore counts and odors. In addition, microorganisms can also corrode metal surfaces and equipment parts, eventually causing replacement of infrastructure. 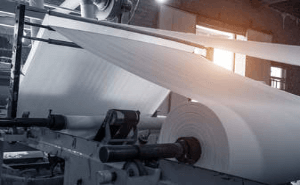 GO2 chlorine dioxide is a broad spectrum oxidizing biocide that can be used as an effective control against microbiological growth in pulp and paper processing. GO2 is especially effective in conditions that are unfavorable to chlorine. Since GO2 is used for potable water disinfection, it is applicable to use for food grade paper applications. Food grade paper is required to meet higher microbial standards because bacterial spores, such as the genus Bacillus are difficult to inactivate. Many microbes are spore formers and can survive in harsh environments. GO2 is an effective sporicide, especially in food grade paper applications. Very effective in systems with a high pH, ammonia-nitrogen contamination, persistent slime problems, or where the microbial contamination is aggravated by contamination with vegetable or mineral oils, phenols, or other high chlorine-demand producing compounds. Unlike chlorine, GO2 is relatively non-reactive with most organics found in the alkaline whitewater. This means that when applying GO2 into the system, a large amount of GO2 fed will be exclusively available for disinfection. Bacterial activity can be reduced to the desired level by controlling the feed rate. GO2 reacts rapidly and can be applied immediately before the problem area. The generation of GO2 allows for flexibility in application points where problem areas occur. The required dosages will vary with water conditions, the severity of contamination, and the degree of control desired. For control of bacterial slime, the required residual concentration of GO2 range between 0.1-5.0 mg/L for intermittent doses. The maximum acceptable residual concentration of GO2 is 0.1 mg/L for a minimum 1 minute of contact time.